A genuine black Samsung UK adaptive fast mains charger for your Samsung Galaxy smartphone. 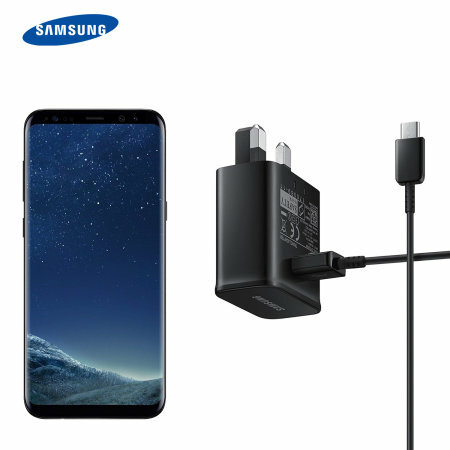 This is identical to the black charger supplied with the Samsung Galaxy S8 and S8 Plus - EP-TA20UBE. Comes complete with an official 1.2m Samsung USB-C cable. Needed a spare charger for my work travels. I know Mobile Fun provide the genuine article as opposed to other sites where the product is not as advertised - delivered on time and works just fine. Product arrived on time and it was packaged well .It looked like it was an authentic Samsung product.Its working fine.Mobile fun has always been reliable so far and Ive bought a few products from them in the past. Works great, no issues at all, arrived very quickly, very happy with my order. I am very happy as this is original product in samsung box. Worth the money. Excelent product, fast delivery! Tanks mobilefun???????? Genuine samsung product. Arrived swiftly. Bought to replace old charger, which was no longer fast charging. Works great, genuine Samsung product, charges fast and best price around. Item is totally genuine samsung accessory. Very pleased. Fast charger which matches the one provided with my phone. Same product as original. Excellent.